After many hours of discussion, my wife, Vicki, and I decided to install a set of davits on Freelance, our Pearson 36 cutter. We hoped davits would solve our dinghy storage problem and save us time getting the dinghy in the water. We also knew that not having to tow it astern would increase our boatspeed in light air. We considered building custom davits, but decided that a clamp-on type would be fine. 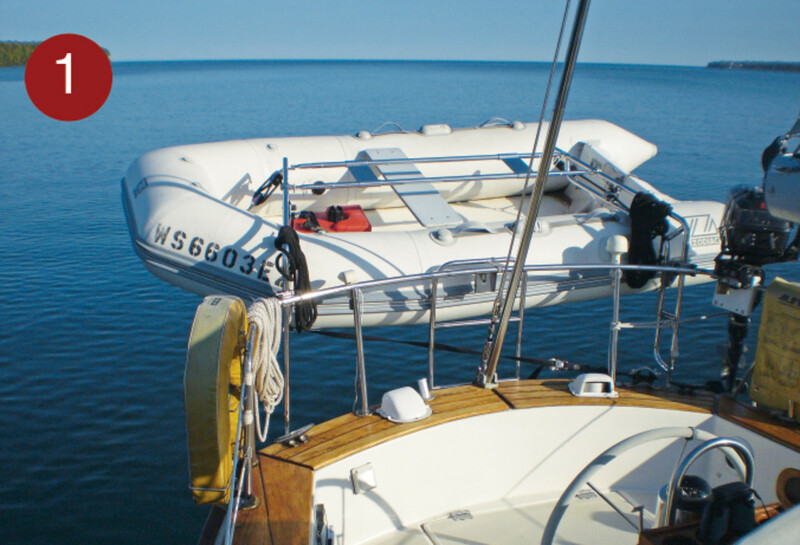 Unless the dinghy to be hoisted is very heavy, the aft pulpit on most 35-foot cruising boats is strong enough to carry the additional load: check with the boat’s manufacturer to make sure. We knew our pulpit was strong enough and could be fitted with clamp-on davits. The next step was to compute the maximum load the davits would have to carry so we could determine the type of davits to install. Our RIB dinghy weighs 110lbs, its 8hp outboard 74lbs and a full fuel tank about 25lbs. The anchor and related safety items add another 25lbs, so we concluded that a system designed to carry at least 250lbs would fit our needs. Although several manufacturers make comparable products, we chose the SD-30 model from Ocean Marine Systems because the small footprint of its lower mounts fit well on our wooden cap rail. The davits arrived, along with an easy-to-follow installation guide. We began the installation by carefully measuring, and then marking with masking tape, exactly where the lower mounts should sit on the cap rail. With our system, it’s important that the lower tips of the davits are located 6 to 12 inches closer together than the lifting points on the dinghy. This is so the dinghy can be brought up tight against the davit arms, to avoid chafe from the tackle and reduce the dinghy’s swinging movement. Obviously, you also need to choose strong mounting positions and locate the davits symmetrically on the stern. After completing our mock-up, we fastened the arms loosely to the pulpit rail with the system’s U-bolts to confirm the intended position. We made some minor adjustments before marking the cap rail locations and then drilling them. Drilling through any exterior surface on a boat is always a bit tense and, for me, was by far the hardest part of this installation. But the drilling went fine and the lower mounts, with their strong backing plates, were then properly through-bolted and tightly sealed with silicone. The next step was to bolt the lower ends of the davits to the lower mounts and confirm the alignment of each davit before tightening the U-bolt rail clamps. When that was done we checked the lifting tackle mounted at the upper end of each davit arm. We had specified a 4:1 tackle for the bow and a 6:1 tackle for the stern, because we wanted to leave the motor mounted on the dinghy when we stored it in the davits. We then swung the two arms into their working position so we could adjust the optional double-strut. The double-strut stiffens the system to minimize movement when underway. To get the davit arms properly positioned, we lifted the dinghy up and used a strap to bring the tips of the arms in to the point where there was no line chafing on the dinghy’s bow tube and there was enough clearance for the outboard. When we were through, the davit arms formed a trapezoid. 6. When the double support strut is removed, it is easy to swing the davits into the transom, out of the way.7. Optional cam cleats make it easier to raise and lower the dinghy, particularly when working singlehanded. With the arms correctly positioned, we moved the sliding tubes inside the double-support strut until they fit perfectly, then drilled and bolted them in place. When drilling stainless use oil or a special compound to cool the drill bit. Also be careful not to crimp the metal tubes when tightening the nuts and bolts. We mounted the double-strut assembly to the davit arms with quick release pins. We then removed the strap and pulled the dinghy up tight into its stored position. A close inspection showed that everything was installed correctly. We were very pleased with how nice it all looked. There were still some details to attend to. First, we had to be sure the dinghy would not move when Freelance was underway. Minimizing chafe is one reason, but any motion can also quickly develop into a force that, like a battering ram, can cause severe damage to the dinghy and the davit system. 8. When the dinghy was hoisted in place on the davits, it covered the stern light, which was relocated to a different position.9. The finished dinghy davits looked as though they had always been there. Remember to pull the dinghy’s drain plug when it is out of the water. To snug up the dinghy’s stern we tied a piece of low-stretch yacht braid to an eyepad inside the dinghy’s transom then led it under the inboard tube and across our boat’s transom, to a cleat on the starboard davit. To hold the bow in place we used a ratchet strap running from an eye on the dinghy’s bow to a cleat on the port davit. We’ve found that this keeps the dinghy immobile even when the motor is attached. Always watch for chafe, because even the smallest movement can produce black marks and worn spots on an inflatable dinghy. To guard against this we always put some chafing gear between the davit arms and the inflatable’s tubes. We’ve carried our dinghy on our davits in 30-knot winds and 8-foot seas sailing on Lake Superior. Our davits have proven to be everything we had hoped, and they even give us an extra half-knot of speed in light air.